Hi, everyone! Before anything else, I'd like to greet you all a Happy Valentine's Day! How are you wearing your nails today? I have been busy since February started. Hence, the lack of nail art posts. My nails are also trying to recover from serious breakage (again). But I will not let the day of hearts pass by without posting a Valentine's nail design. 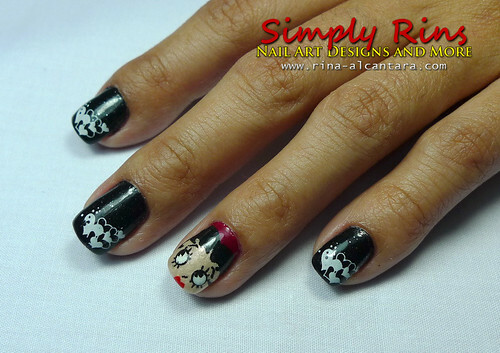 a classy but rockin' valentine nail art design.. Valentine's Day is coming up,but instead of a sweet romantic nail art, your date sees a classy yet rock star themed nails. i know you can do a twist on those usual valentine nails. 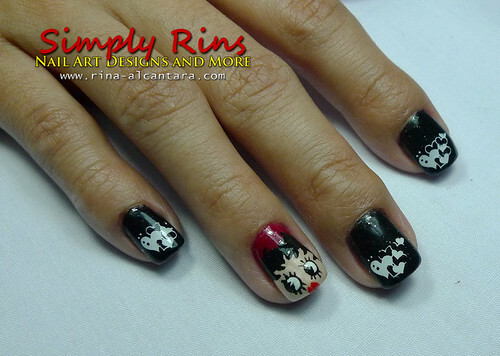 I thought that black was an unusual color to wear during Valentine's Day but I think Betty Boop made the nail design work for the occasion. A small hint of red also made the nail art wearable for Valentine's. Orly Goth has been one of my favorite black polish because it adds a little attitude to the color with minimum glitters. I used 2 coatings on each nail except for my ring fingers. I painted 2 coats of Sally Hansen Honeymoon Red as base color for Betty Boop. Betty Boop is trying to drink my coffee! I did this Valentine's nail design a day before my partner and I decided to go to the 16th Philippine International Hot Air Balloon Fiesta at Pampanga. We were driving very early the following morning that I didn't have time to complete the design after painting Betty Boop. I didn't mind. Orly Goth was enough to make the design still interesting. 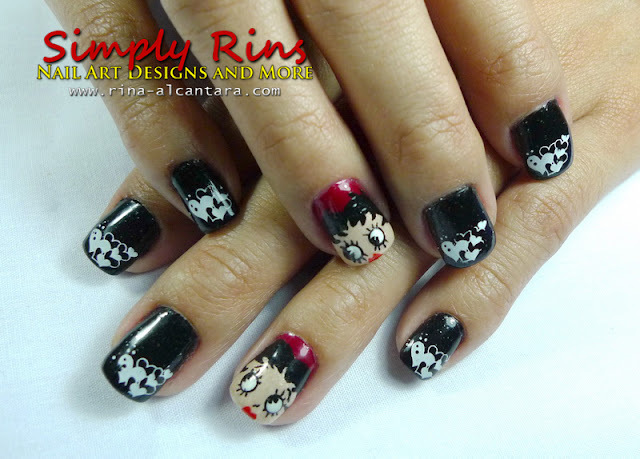 I used Zoya Buffy for Betty Boop's face. I must get a second bottle of this because I've been using this nail polish to paint those that represents skin. Hair and outlines were drawn using black acrylic nail paint. For the hearts, I picked up an image from the Konad m35 plate and used white Konad special polish for stamping. I just concentrated on the nail tips for the hearts. Since Betty Boop have a wide face, I tried to mimic it by trying to made my nails look wider by painting a not so thick layer of white acrylic on the side of my ring fingernails. It worked but I'm not so sure if it appears awkward. Thanks to my partner who took the photo on the left during our pre-Valentine's date at Pampanga. We were able to do a lot of things yesterday. We attended the Hot Air Balloon Fiesta, visited a nearby Zoo and experienced the Zooc ride, went window shopping at the newly opened Marquee Mall, ate Kabigting's famous halo-halo dessert, and had my car cleaned before going home. 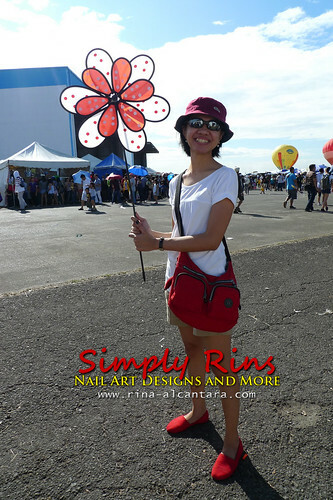 I was able to buy a pinwheel during the fiesta that reflected my favorite color! Oh, and it matched my outfit too! As much as I wanted to wear a red shirt yesterday, I intentionally didn't because I was expecting a hot day so I decided white is more practical. But I just can't go on a pre-Valentine's date without something red so I wore my favorite red breton Posh Pocket Shoes and the red bag Nanay gave me a few years back. Your nail art is amazing!!!!!!!!! I love how you draw so well! To -Diana-, Happy Hearts' Day too! :) Thanks for dropping by! Wow, Betty's face is perfect! You are so talented. I find Betty Boop utterly adorable and I tire easily of generic, cliched Valentine's designs so this is perfect! To Danielle, I think so too! 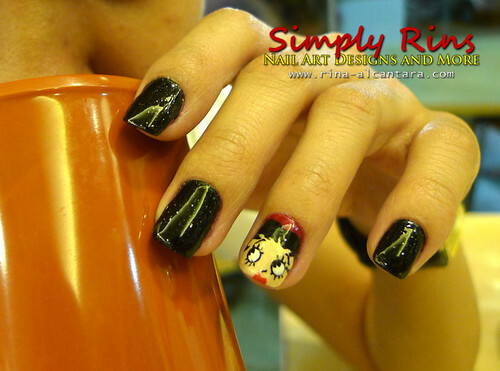 Betty Boop and black nails for Valentine's! I am going to use it very soon.